We’re harvesting some pears here at the farmstead and it got me to thinking about the “perfect” pear. As your teeth sink into it, the sweet juice runs down your chin and the texture is “just right” – not mealy or too hard. Many times, that perfect pear is elusive…at least it was for me for most of my life. But that is because until recently, I never really understood how a pear ripens. 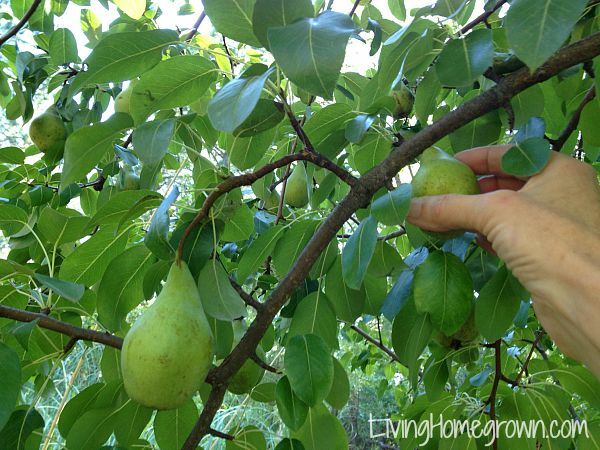 It took having a pear tree of my own for me to learn how it all works. 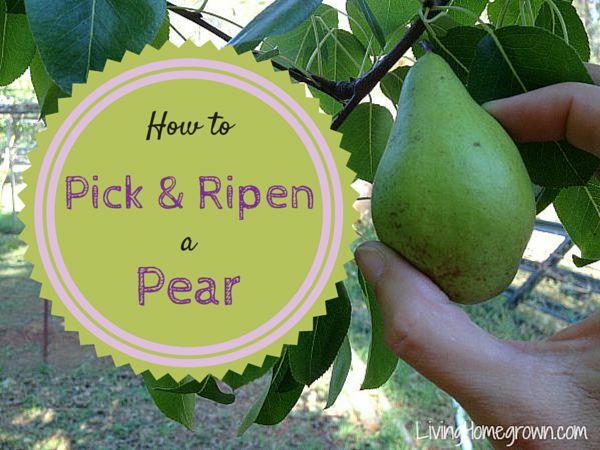 In this post, I share some tips for picking the perfect pear (on the tree or at the grocery store) and how to get it to ripen to perfection. Unlike other fruit, pears do NOT ripen properly when left on the tree. They are one of the only fruits that must be picked unripe and allowed to ripen off the tree. If left on the tree, a pear will over-ripen from the inside out and the center will be mush and rotten before the outside gets soft. If you harvest them yourself, pears must be picked when they are within that magic window of time of being mature but unripe. Mature means they are fully grown and staying on the tree further begins the breakdown process. Ripe means the flesh is softened and the sugars are high. So, you pick when the pear is mature (not ripe) and let it ripen off the tree. The only exception to this is the Asian pear which does ripen on the tree and can be eaten immediately at harvest. So this post is about all other pears – not Asian. 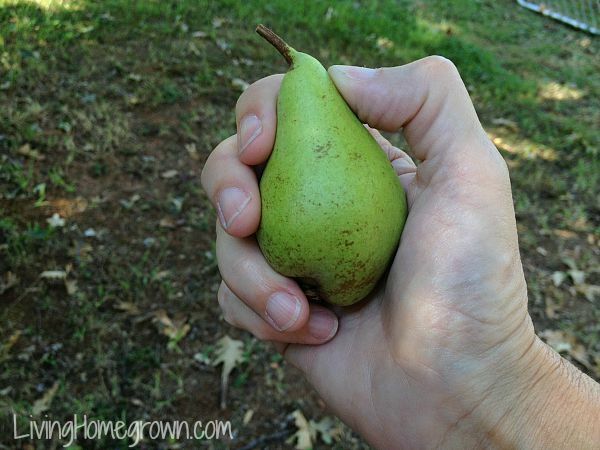 If you grow pears yourself, how do you know when they are mature enough to harvest? It is actually pretty easy. When a pear is ready to come off the tree, it will do so when you slightly twist or tip the fruit’s stem. You simply hold the pear in your hand and rotate it slightly (1/4 turn) and if it comes right off…it’s ready. Or you hold the pear in your hand and tip it horizontally and it will snap off if it is ready. If it does not come off easily, you move on to the next fruit and give that one more time on the tree. Don’t be tempted to pick them immature. They will not have the best texture or flavor. What I never knew (before having a tree of my own) was that many commercial pears are put into cold storage immediately after harvest before going to market. This cold storage tip is NOT what you should do with store bought pears. A purchased pear should never go into the refrigerator. It should ripen on the counter because it is brought to market ready for you to take home, ripen and eat. Cold storage is only something you would do if you are harvesting from your own tree. Growers put pears into cold temperatures to not only give themselves more time to get the harvest to market, but ALSO to help with the ripening process on certain varieties. Different pear varieties prefer different amounts of cold storage. European varieties can take the longest in cold storage and Asian pears require none. So if you own a pear tree, you can briefly cool down any variety and it may help (won’t hurt) in giving you a nice ending texture/flavor. Cold storage can be as simple as a week in a cool basement, the refrigerator or other cold area of the house. If you don’t have a place for cold storage, don’t worry about it! Your homegrown pears will still ripen at room temperature. The cold storage just gives you the most ideal and most consistent results. But it is not required to have a good pear. After cold storage of homegrown pears, you can move on to ripening the pear on the counter as I have described below. Pears at the store or farmer’s market should be picked firm and with the least amount of bruising. In other words, you are picking out a mature pear that is unripe – just like it was at harvest time. It is rare to find a pear ready for eating at the store. Most will still be hard as a rock. You should expect to buy them in the firm state and bring them home to ripen. Ripening a pear can be as simple as sitting it on the counter top and checking it every day. If you want to speed up the process, set a few apples or bananas next to the pears. The apples/bananas will give off ethylene gas which hastens the ripening process. If you REALLY want to speed up the process, place the pear in a paper bag with an apple or banana and it will go even faster. Do not refrigerate the pear until it reaches full ripeness. Once ripe, you may place the pear in the refrigerator for a day or two to hold it at that state until you are ready to eat it. A pear is ripe when you can press on the flesh of the neck and it gives a little. The Pear Bureau has a little fact sheet that gives more details. What is your favorite pear variety? Do you preserve any pears or do you only eat them fresh? We grow a real old time pear from trees on our farm that date back many years. These are real hard pears but make excellent pear preserves. You have to own a very sharp knife to cut and peel them. Some people do buy them for eating as they like the crunch. Reminds me of an apple but with a pear taste. I have canned Bartlett pears before and they turned out great.. My mom and dad used to dehydrate their pears and my sisters and I would eat them just like they were candy! Sooo good! My husband and I will be planting our first pear tree this winter. I think we are going to get the 3 in 1 type: Bartlett, DeAnjou and Red something. Thank you for all this info! I love 3 in 1 trees. So cool looking when they fruit. Glad you liked the post! We have an old pear tree that I’m afraid won’t be with us too much longer. I’ve never actually harvested the pears. Many years the squirrels throw them down before they are even close to ripe. One year, I picked a bunch of fallen pears and made a really good pear sauce with cardamom. It’s looking like a good pear year—I’m going to try picking some this year now that I know when to do it. I have a squirrel problem with my trees in Los Angeles. That little bugger will take a bite out of every apple on the tree – never eating a whole apple. I wouldn’t mind sharing with him if he would just eat one fruit at a time! I love Bartletts. We have some in our orchard and we do exactly as you said. I love to eat them fresh but I also dry them,can them as halves or as pear sauce.